Mobile capture is quickly becoming an important differentiator for many companies and organizations, especially those in traditionally document-intensive fields like banking, insurance, healthcare and government operations. According to a 2014 study conducted by AIIM, 45% of companies feel that mobile capture is vitally important, pointing to the competitive need for improved process agility and customer service across the board. 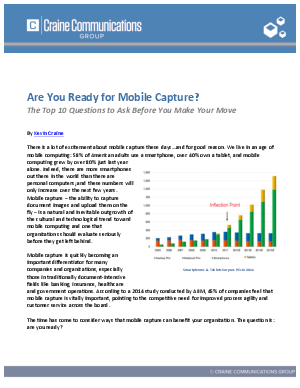 Discover the top 10 questions to ask before you make your investment in mobile capture.